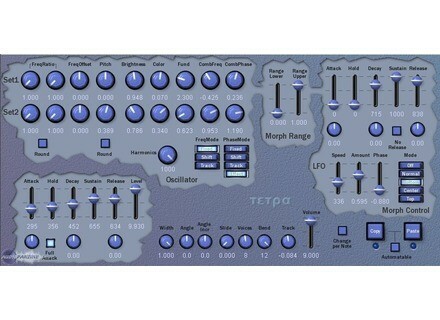 Tetra [Freeware], Other Virtual Synth from Moppel. Moppel has updated Tetra to v1.2. Fixed crackling noise when running multiple synth instances on multi-core systems. Added 11 new presets, retuned old presets. Minor speed improvements (about 10% less CPU drain). Fixed potential pops and sticking notes. Limited the maximum generated frequency to 21kHz even at sample rates greater than 44.1kHz to avoid volume change at different sample rates. For more info, check out www.tutututututu.de/synths/. Line 6 January Discounts Line 6 is offering discounts on some of its add-ons through January 31st -- additional amps and effects models, plug-ins, and recording software. [NAMM] Books of Rhythm Special Edition The Percussion Marketing Council annonced a new addition to its Roots of Rhythm world drumming classroom education program: Roots of Rhythm: Special Edition. Intermorphic Updates Mixtikl To v1.0.0.4 Intermorphic has updated Mixtikl to v1.0.0.4.